Before downloading any of my lots, please read the important warning at the bottom of the page. 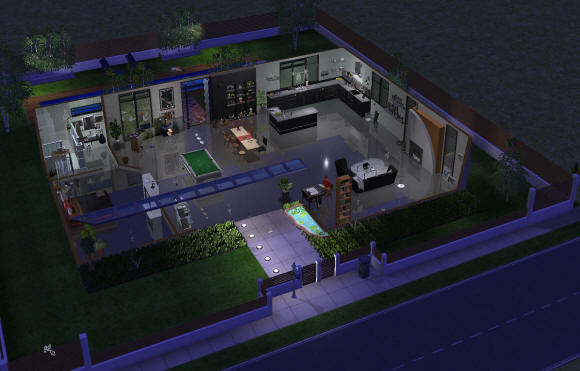 Here is an industrial modern home chock full of precious items and objects from creators all over the globe throughtout the Sims 2 era spanning over a decade. Some objects are old, some are newer - if anything included is yours and you don't want it included in downloaded lots, just let me know, no infringements intended! Click here to see more detailed pics and download this home. WARNING: My lots have been checked with Pescado's Lot Debugger as well as Cyjon's Lot Inspector and reported as clean of off-world loiterers fragmented data which can cause memory and relationship issues in a neighborhood. Feel free to check them yourself, but what I would at least definitely do before installing downloaded lots is clean out the root folder of Downloads (except CEP of course) and then install the lot into a completely empty NH and proceed from there. I delete things from the Lot that I don't want and then repackage it. Then I can delete all but CEP in Downloads root and re-install the lot using the same technique but this time I can go ahead and sort the packages into the various folders by room sort or site sort or whatever works.